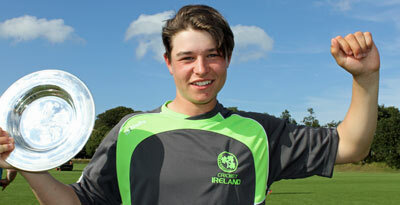 Rush wicket-keeper batsman Neil Rock will skipper the Ireland Academy side on their five-day tour of England next month. The 18 year-old, who will also be at the helm when Ireland U19's take part in the U19 World Cup Qualifying tournament in The Netherlands this July, is one of three Rush players named in the 14-man squad, alongside opener Stephen Doheny and newly signed Jarred Barnes. Jack Tector is Rock's deputy and the YMCA batsman is joined in the line-up with Claremont Road team-mate Fionn Hand. Cousins David and Gareth Delany are also named, while the Merrion duo of Max Neville and Tyrone Kane are included, while Pembroke's Fiachra Tucker completes the ten-strong Leinster contingent. There are three NW players in the squad, with Ballyspallen's Graham Kennedy, Strabane's Aaron Gillespie and Brigade new signing Ross Allen included. The trio are all former Irish youth internationals, and have been playing their trade successfully over the winter in Australian grade cricket. New face Marcus O'Riordan is the sole NCU representative. The off-spinner has joined Muckamore for the 2019 season. The 20 year-old parents are from Cork, and he has spent the last seven seasons at the Kent Cricket Academy. There will be five matches on the short tour, starting with a 50-over contest against Bath on Saturday April 13th, before T20 games against them and Gloucestershire 2nd XI the following day. Monday is a rest day, before they face an England Development XI in a 50-over game at Rockhampton on Tuesday Aril 16, while the tour concludes the following day with another 50-over match against Gloucestershire 2nd XI at the same venue. Pete Johnston will be Head Coach for the tour, with support from Ed Joyce as Assistant Coach. Neil Rock (capt.) (Rush), Jack Tector (Vice-captain) (YMCA), Ross Allen (Brigade), Jarred Barnes (Rush), David Delany (Clontarf ), Gareth Delany (Leinster), Stephen Doheny (Rush), Aaron Gillespie (Strabane), Fionn Hand (YMCA), Tyrone Kane (Merrion), Graham Kennedy (Ballyspallen), Max Neville (Merrion), Marcus O'Riordan (Muckamore), Fiachra Tucker (Pembroke).